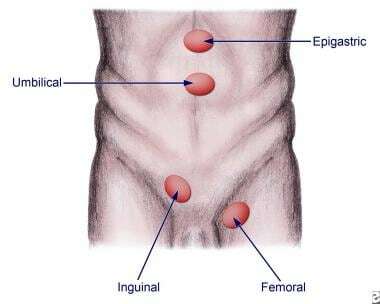 Hernias may be broadly divided into two main groups, depending on whether they develop in the upper abdomen or in the groin (see the image below), and each group contains multiple types. 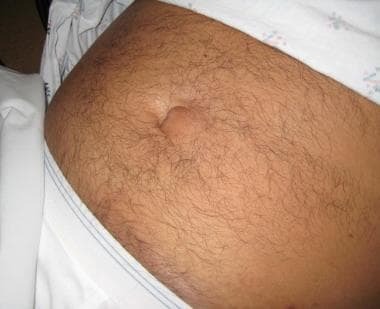 50-year-old man presents with recurrent umbilical hernia, which is reduced in emergency department. Before surgical repair of a hernia, manual reduction can return the tissue to its original compartment. Reduction benefits the patient by mitigating associated symptoms, avoiding adverse outcomes such as strangulation, and permitting elective surgical repair, which has lower morbidity than emergency repair. [5, 6] The most common hernias amenable to reduction are described in this article. The presence of a nonstrangulated hernia is an indication for manual reduction. Although an incarcerated hernia can be strangulated without the usual signs and symptoms of strangulation, reduction should be performed for most incarcerated hernias when clinical evidence of strangulation is not present. Although strangulation can be missed,  one prospective study showed that clinicians are usually correct in deciding when to reduce an incarcerated hernia and when to defer reduction of a strangulated hernia. In addition, harmful outcomes to attempted reduction are unlikely in these unrecognized strangulated hernias. Manual reduction is contraindicated in strangulated hernias. In such cases, nasogastric suction, fluid replacement, and antibiotic therapy can be started. This classification also helps direct treatment. If a hernia is easily reducible, the abdominal contents can easily be returned to their original compartment. Reduction not only allows symptomatic relief for patients but also reduces the risk of future incarceration. Although reduction helps alleviate patient's symptoms, elective surgical repair is usually warranted for long-term management. 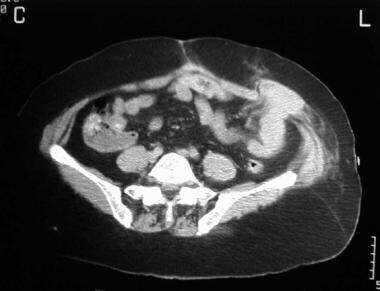 64-year-old woman presents with vague abdominal pain of 2 days' duration. Physical examination reveals tender palpable mass in left lower quadrant. CT reveals incarcerated ventral hernia. A strangulated hernia (see the image below) is a surgical emergency in which the blood supply to the herniated tissue is compromised. Strangulation stems from herniated bowel contents passing through a restrictive opening that eventually reduces venous return and leads to increased tissue edema, which further compromises circulation and stops the arterial supply. Erythematous edematous left scrotum in 2-month-old boy with history of irritability and vomiting for 36 hours. Local signs of this magnitude preclude reduction attempts. Read RC. Recent advances in the repair of groin herniation. Curr Probl Surg. 2003 Jan. 40(1):13-79. [Medline]. Rai S, Chandra SS, Smile SR. A study of the risk of strangulation and obstruction in groin hernias. Aust N Z J Surg. 1998 Sep. 68(9):650-4. [Medline]. Chirdan LB, Uba AF, Kidmas AT. Incarcerated umbilical hernia in children. Eur J Pediatr Surg. 2006 Feb. 16(1):45-8. [Medline]. Fitch MT, Manthey DE. Abdominal hernia reduction. Roberts JR, Custalow CB, Thomsen TW, Chanmugam AS, Chudnofsky CR, DeBlieux PMC, et al, eds. Roberts and Hedges' Clinical Procedures in Emergency Medicine. 7th ed. Philadelphia: Elsevier; 2019. 897-903. Nilsson H, Stylianidis G, Haapamaki M, Nilsson E, Nordin P. Mortality After Groin Hernia Surgery. Ann Surg. 2007 Apr. 245(4):656-660. [Medline]. Alvarez JA, Baldonedo RF, Bear IG, Solís JA, Alvarez P, Jorge JI. Incarcerated groin hernias in adults: presentation and outcome. Hernia. 2004 May. 8(2):121-6. [Medline]. Smith G, Wright JE. Reduction of gangrenous small bowel by taxis on an inguinal hernia. Pediatr Surg Int. 1996 Oct. 11 (8):582-3. [Medline]. Askew G, Williams GT, Brown SC. Delay in presentation and misdiagnosis of strangulated hernia: prospective study. J R Coll Surg Edinb. 1992 Feb. 37(1):37-8. [Medline]. Kauffman HM Jr, O'Brien DP. Selective reduction of incarcerated inguinal hernia. Am J Surg. 1970 Jun. 119(6):660-73. [Medline]. Fitzgibbons RJ Jr, Quinn TH, Krishnamurty DM. Abdominal wall hernias. Mulholland MW, Lillemoe KD, Doherty GM, Upchurch GR Jr, Alam H, Pawlik TM, eds. Greenfield's Surgery: Scientific Principles and Practice. 6th ed. Philadelphia: Wolters Kluwer; 2017. Chap 72. Perrott CA. Inguinal hernias: room for a better understanding. Am J Emerg Med. 2004 Jan. 22(1):48-50. [Medline]. Fitzgibbons RJ Jr, Giobbie-Hurder A, Gibbs JO, Dunlop DD, Reda DJ, McCarthy M Jr. Watchful waiting vs repair of inguinal hernia in minimally symptomatic men: a randomized clinical trial. JAMA. 2006 Jan 18. 295(3):285-92. [Medline]. Stylianos S, Jacir NN, Harris BH. Incarceration of inguinal hernia in infants prior to elective repair. J Pediatr Surg. 1993 Apr. 28(4):582-3. [Medline]. Gallegos NC, Dawson J, Jarvis M, Hobsley M. Risk of strangulation in groin hernias. Br J Surg. 1991 Oct. 78(10):1171-3. [Medline]. Hair A, Paterson C, Wright D, Baxter JN, O'Dwyer PJ. What effect does the duration of an inguinal hernia have on patient symptoms?. J Am Coll Surg. 2001 Aug. 193(2):125-9. [Medline]. Andrews NJ. Presentation and outcome of strangulated external hernia in a district general hospital. Br J Surg. 1981 May. 68(5):329-32. [Medline]. Brindley N, Taylor R, Brown S. Reduction of incarcerated inguinal hernia in infants using caudal epidural anaesthesia. Pediatr Surg Int. 2005 Sep. 21(9):715-7. [Medline]. Millat B, Borie F, Fingerhut A. Patient's preference and randomization: new paradigm of evidence-based clinical research. World J Surg. 2005 May. 29(5):596-600. [Medline]. Leem JG. Ultrasound-guided Nerve Blocks for Post-hernia Repair Pain. Korean J Pain. 2010 Dec. 23(4):227-9. [Medline]. Sinha R, Rajiah P, Tiwary P. Abdominal hernias: imaging review and historical perspectives. Curr Probl Diagn Radiol. 2007 Jan-Feb. 36(1):30-42. [Medline]. den Hartog D, Dur AH, Kamphuis AG, Tuinebreijer WE, Kreis RW. Comparison of ultrasonography with computed tomography in the diagnosis of incisional hernias. Hernia. 2009 Feb. 13(1):45-8. [Medline]. Narci A, Korkmaz M, Albayrak R, Sozubir S, Guvenc BH, Koken R, et al. Preoperative sonography of nonreducible inguinal masses in girls. J Clin Ultrasound. 2008 Sep. 36(7):409-12. [Medline]. Torzilli G, Del Fabbro D, Felisi R, Leoni P, Gnocchi P, Lumachi V. Ultrasound-guided reduction of an incarcerated Spigelian hernia. Ultrasound Med Biol. 2001 Aug. 27(8):1133-5. [Medline]. Chen SC, Lee CC, Liu YP, Yen ZS, Wang HP, Huei-Ming Ma M. Ultrasound may decrease the emergency surgery rate of incarcerated inguinal hernia. Scand J Gastroenterol. 2005 Jun. 40(6):721-4. [Medline]. Mariani PJ. Ultrasonographic diagnosis and facilitated reduction of an abdominal wall hernia. Acad Emerg Med. 2008 Jul. 15(7):691-2. [Medline]. Wright RN, Arensman RM, Coughlin TR, Nyhus LM. Hernia reduction en masse. Am Surg. 1977 Sep. 43(9):627-30. [Medline]. Maupoey Ibáñez J, Carreño Sáenz O, Beltrán Herrera H, Moya Sanz A, Carbonell Tatay F. En masse reduction of an incarcerated inguinal hernia. Emergency laparoscopic management. Cir Esp. 2015 Nov. 93 (9):603-5. [Medline]. [Full Text]. Hoshiai S, Mori K, Shiigai M, Uchikawa Y, Watanebe A, Shiotani S, et al. Reduction en masse of inguinal hernia: MDCT findings of two cases. Hernia. 2015 Dec. 19 (6):999-1003. [Medline]. Watanobe I, Yoshida N, Watanabe S, Maruyama T, Ihara A, Kojima K. Late-Onset Bowel Strangulation due to Reduction En Masse of Inguinal Hernia. Case Rep Surg. 2014. 2014:295686. [Medline]. [Full Text]. Xu X, Hong T, Li B, Liu W, Zheng C, He X. Retroperitoneal hematoma after manual reduction of indirect inguinal hernia. Am J Emerg Med. 2013 Jul. 31(7):1151.e1-2. [Medline]. 40-year-old man presents with left inguinal pain, swelling, and erythema consistent with left inguinal hernia. He is placed in Trendelenburg position to aid in reduction. Ice pack is applied to patient with left inguinal hernia in Trendelenburg position. Slow constant pressure is applied to patient with left inguinal hernia. Emergency department hernia reduction by surgical resident. Sedation with propofol is required after unsuccessful reduction attempt with opioid analgesia. Hernia content balloons over external ring when reduction is attempted. Hernia can be reduced by medial pressure applied first. Inguinal hernia reduction under ultrasonographic guidance. Video courtesy of Ultrasoundpaedia at http://www.ultrasoundpaedia.com.